Last winter we challenged the message board crew to drive towards 40+ pullups by September '04. After a couple of deadline extensions the contest officially ended with seven winners – Lynne Pitts, Kelly Moore, Aaron Fisher, Adam Walinsky, Larry Lindenman, Ryan Atkins, and Graham Hayes. Each received a CrossFit Champion T-shirt. From a contest intended to demonstrate that the secret to high rep pull-ups is desire and that all methods couple successfully with desire, here are Larry Lindenman and Lynne Pitts recounting their paths to success. 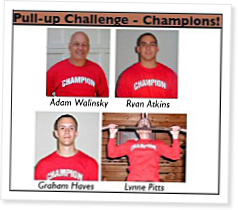 "My pull-up challenge started when the contest was first posted. I had been completing the Workout of the Day since September 2003. I have been doing the WOD, as written, with no modifications, since February 2004. Along the way I have picked up or made every piece of equipment necessary to stock a Crossfit Gym, except I still substitute towel chins for rope climbs and I haven't purchased a GHR bench yet. I am a 43 year old police officer, with approximately 20 years of weight training experience and 37 years of athletic experience. I rockclimb and teach and practice martial arts. I am currently 6'0", 200 lbs, approximately 6-7 % bodyfat. CrossFit is a measurable, observable and repeatable fitness program, and Patrick Cummings of Again Faster takes measurement to the next level in this video shot at CrossFit Fenway. Marines love the pull up and chin up. The dead hang chin up will give you a good idea of how sad you are or how much better you can be. I am 52 and have kept up with pullups as part of my training. I did 27 pullups with the last 7 kipping during a recent police competition. I wish I had practiced and started with the kipping pullup. I have a rope inserted threw some pvc pipe and tied off between two trees in my yard. The small viriation of the rotating pvc and the swinging rope make wasted movements very obvious. The rope between two trees is a great piece of gear for kids of all ages.